In the last 20 years, Turkey has emerged as a major global influence in business, investment, tourism and expat living. So, naturally many foreigners are moving to the country or setting up businesses, and want Turkish citizenship to enjoy the same benefits as a Turk. Advantages of Turkish citizenship include the legal right to work and vote, as well as eliminating the need for a residency permit, therefore, saving time and money. New citizens can also pay into the social security system for health and pension benefits. Our foreign customers with aims of long-term involvement in Turkey, either through living or business often ask how to apply for Turkish citizenship so, in this article, we have listed all the information you need to know as well as helpful hints and tips to support your application. Excluding adoption and other extraordinary cases, most people apply according to one of the following three criteria sets. After three years of marriage to a Turk, you can apply for citizenship. You must be living together unless you can prove the reason for not doing so is force majeure. The activities of both partners in the marriage are assessed to check the marriage is not a pretence for illegal activities such as prostitution or slave trafficking. You must also not be a threat to public order or national security. If you get divorced after the marriage, the foreigner can keep the acquired citizenship. To be eligible for this option, you must have had five years of residency and not been out of Turkey for more than six months during this period. You must have a clean bill of health and a clear understanding of the Turkish language that along with other characteristics will demonstrate your seriousness about living in the country. Another specification is that the applicant has good morals, so it is worth remembering that social expectations are higher than that of western countries. This process refers to the right of citizenship based on lineage, rather than a place of birth. People who have a Turkish mother or father automatically gain Turkish citizenship from birth, no matter where in the world they were born. Turkish Cypriots living in the North of Cyprus often do this because other countries rarely recognise travel documents issued by the TRNC. If you are in a country, other than Turkey, get in touch with the Turkish consulate or embassy there, to start the process. You do not need a Turkish residency permit in this case. Otherwise, if you already live in Turkey, and in possession of a residency permit, apply at the Population Office (Nufus Mudurlugu) in your hometown. The department that handles the application is Vatandaslik, and they issue the application forms, or you can download them from the official website below. A foreigner applying based on long-term residency will use form number 3. To apply based on marriage to a Turk, use form number 6. Otherwise, the other application forms are to be used for other examples including adoption, lineage or as a citizen of the Turkish Republic of Northern Cyprus. If applying based on marriage to a Turkish citizen, you will need to show their Turkish Kimlik identity card and registration details, which are available from the Nufus office. If you married inside Turkey, show copies of your red marriage book otherwise, you will also need to produce your wedding certificates from the relevant country. If applying on long-term residency basis, you will need to show your residence permit with six months validity as well as proof of your income and ability to support yourself, as well as an affidavit showing your marital status. Note: Any documents issued by a foreign country must be apostilled, translated and notarized. Currently, foreign males over the age of 41 are exempt from compulsory military service; however, if you are a male, it is worth checking your exact status before making the application. If you are applying from within Turkey, the police will make a sudden spot check without notification to your home. They may also speak to your neighbours, friends, and family. After that, the next step is an interview of which you will be notified of the time, date, and place beforehand. The discussion panel consists of local officials such as police, education, and military, who will ask you questions in Turkish so learn as much of the language as possible. They will also ask questions to prove your interest and enthusiasm in becoming a Turkish citizen, so learn some general knowledge facts. Examples include culture, traditions, travel, cuisine, arts, famous Turkish authors or singers as well as facts about the country such as the national anthem and public religious holidays. The panel will pass their recommendations onto the Ministry of Interior who handles the final approval, but you can check on the status of your application by using the Alo 199 function on the official website. Turkey allows for dual citizenship but check with your current country, to see what their laws say. Also remember that foreigners with dual nationality living in Turkey, are no longer automatically entitled to representation of their home country consulate if charged with a criminal act or need assistance. 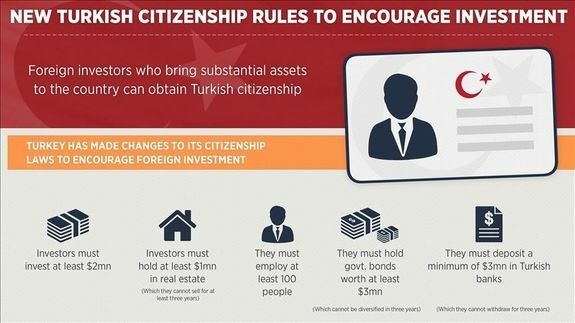 Turkey also gives citizenship to highly qualified investors if they buy property worth 1 million USD, retain 3 million dollars in Turkish banks, or create 100 jobs. This is naturally out of the question for many budget or mid-level investors in which case, the Turquoise card scheme that is the equivalent of a green card in the USA, might be more viable. Mainly appealing to foreigners who want citizenship so they can legally work, they do not receive the right to vote or stand for office as a fully-fledged citizen does, but can still opt into the social security system and enjoy other benefits. As long as you can show your profession is a valid contribution towards the Turkish economy, art or sports scene, or fields of education and science or technology, you are eligible to apply. The Turquoise card scheme will also appeal to people looking to relocate their family to the country because it covers spouses and dependents.